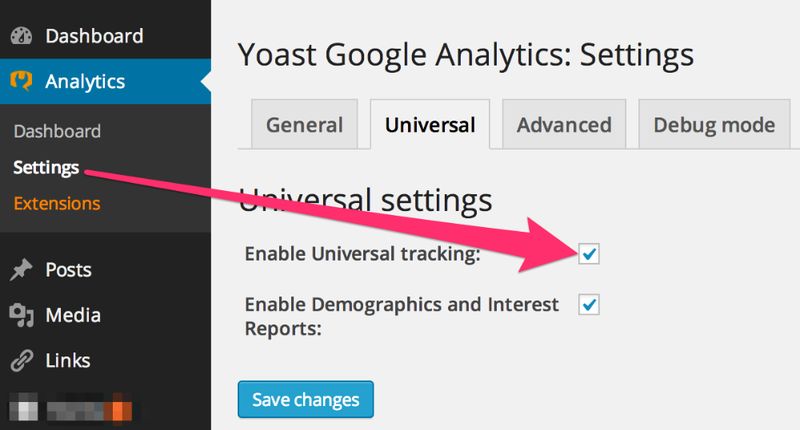 Our Google Analytics by Yoast plugin now supports Universal Analytics! Obviously, before you can use that kind of tracking, you'll have to switch to Universal Analytics in Google Analytics. We've made it very easy for you to do so, just follow the steps below. 1Log into your Google Analytics account here. Select the property for your domain. Click on 'Admin' from the top menu. You should see something like this: 2If you do not see the notice 'Transfer not started', your account has already been upgraded to Universal Analytics and you can skip to step 5 below .If you see the notice 'Transfer not started', click on it. You'll see the following window and click the "Transfer" button. 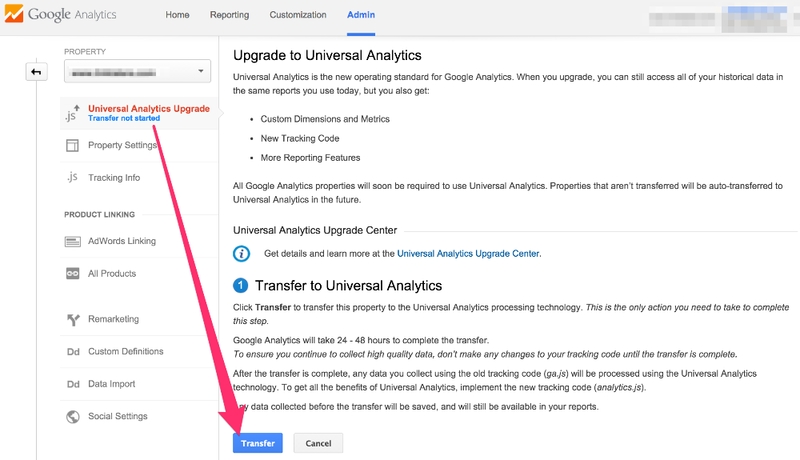 4To upgrade to Universal Analytics, click the "Transfer" button in this popup. It can take Google Analytics 24-48 hours to complete the transfer to Universal Analytics. Please do not do anything before this transfer is complete! You'll know the transfer is complete because the "Universal Analytics Upgrade" notice will say "Transfer complete" below it.5Once your transfer is complete, all you have to do is check this box in our Google Analytics by Yoast plugin: 6And you're done. Your Universal Analytics is now all set up and working! now supports Universal Analytics! Obviously, before you can use that kind of tracking, you'll have to switch to Universal Analytics in Google Analytics. We've made it very easy for you to do so, just follow the steps below.